Various - "Heimatklänge Vol. 6: Lusomania -Transatlantica"
Join in and share the Lusophonic highlights of seven hot SDaturday night shows recorded 102% live at the HeimatKlänge Festival. 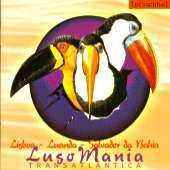 Lusomania features: Brasil's Samba-Reggae Queen Margareth Menezes, Capeverdian happy melancholy with Simentera & Agostinho de Pina, Angolan Soukous by Waldemar Bastos, the dancing Forró accordion by Oswaldinho & his Banda Som de Forró, Chico Science & Nação Zumbi with wild Mangue Beat by Maio Coope & Gumbezarte and Angolan hero Bonga.Let's go Lusomania!